HomeIs your “Regarding” field on activities set correctly? MS Dynamics CRM gives you a plethora of options for setting your activities regarding a specific record. Most companies have guidelines on which entity certain activities should be set to. For example, an often recommended approach is to set activities regarding the opportunity it is about. However, if a sales person simply clicks on the track button in Outlook, rather than “Set Regarding,” and go through the process of selecting the right record, the email will be associated with the contact, not the opportunity. In the defense of sales people, clicking the track button does seem like the obvious thing to do. 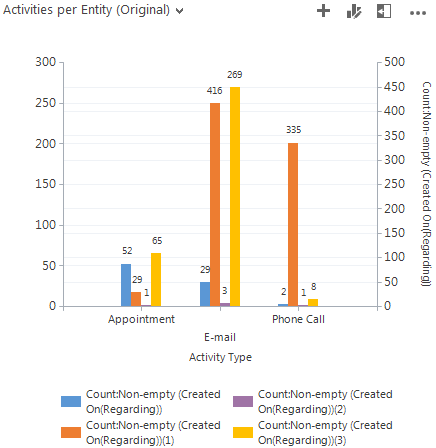 In order to follow up on whether or not activities are set regarding to the correct entity, we can create a chart that show the count of activities per type, and which entity they have associated them with. The chart tells us which type of entities the users are focusing on. 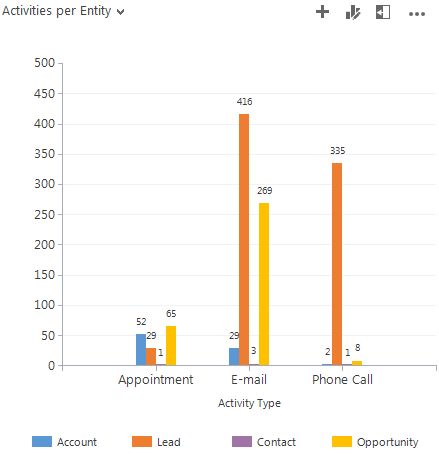 There should be a healthy balance between activities on leads and opportunities depending on how you are using MS CRM. First, open up Advanced Find and select the Activities entity and open Edit Columns. Open the Record Type option set and scroll down to the section that begins with Regarding. This is a list of all the entities that activities can refer to. Add a column for each of the entities that you would like to include in your chart. After you select a regarding entity, you have to select a field. Choose a field that you know always is populated. I like to use the field “Created On”. To this view I have added the “Created On” field for Leads, Accounts, Contacts and Opportunities. Each column will be populated with the “Created On” date. The view in itself, is not very helpful, but the important part is that there is only data in the Account column, if the Activity is related to an Account. I cannot see which is which, but that is OK for now. Save your view and navigate back to the activities section in MS Dynamics CRM and open your new view. Open the chart editor and start adding the “Regarding” fields to your legend entries. If we had not added the fields to the view first, they would not have been accessible in the chart editor. 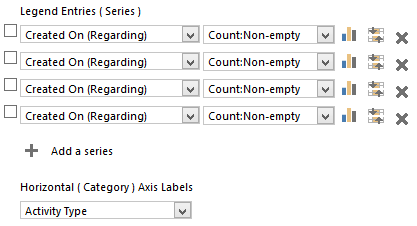 Make sure that the aggregate is set to Count:Non-empty, so we only count the records that have a value in that field. This means the chart only counts for the field when the activity is regarding an entity of that type. Set the category to either Activity Type or Owner depending on your needs. Now we have a chart that shows us the amount of activities per type and the regarding entity. 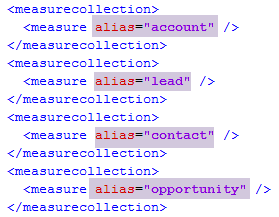 Unfortunately, not even the person who made it can decipher which series belongs to which entity, so we’ll export the CRM chart xml and do some clean up. First, we now have the almost mandatory step of removing the secondary Y axis. Find this sucker in one or more of the series and delete it. For good measure, although not required, remove the AxisY2 section. Luckily we do not have to remember the order of how we added the different entities. That information is present in the <fetchcollection>. I’ve renamed the aliases in the example above so it is easier to read. If you do that, remember to update them in the <measurecollection> as well. Finally, in the series, add the LegendText so it will make sense to the user. The series follow the same order as the <measurecollection>. Import the chart back in to MS Dynamics CRM. While the example used Activity Type as the category, this can easily be replaced with Owner, to see which entities users focus their activities on. It is also a very good indicator if users set the Regarding field according to the company guidelines. Very useful. What would be even more useful is to change the clustering to see The entity types on the horizontal axis, and the Activities associated with each entity. “Here are all of the Appointments, Phone Calls, email, Tasks related to Accounts. Here are all of the Appointments, Phone Calls, email, Tasks related to Contacts. etc. How would you do this by week instead of entity? In other words, do display the number of e-mails, appointments, and phone calls, per week for the last five weeks? I have just tried this out in the Unified Interface. It seems there are a new kind of legend happening here. The dots in the top with legend text. – But not the legend text defined in the XML that works in the classic interface. Do you know where to edit the legends in the charts in the Unified Interface?